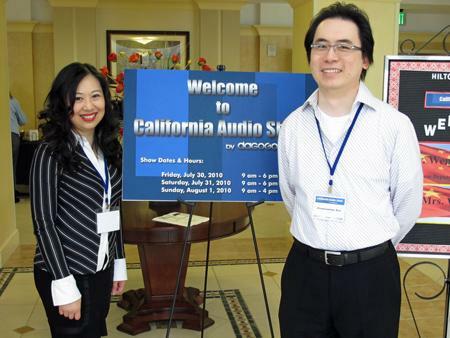 Constantine and Ann Soo deserve a huge thank you from the audiophile community. 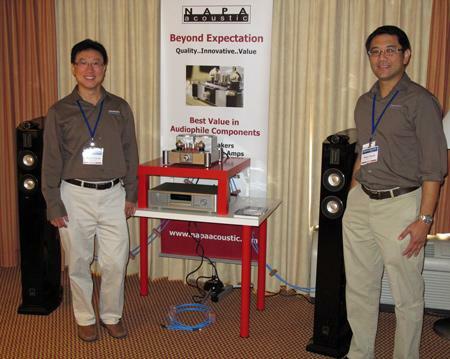 Responding to pleas from insistent dealers and distributors, who lamented the absence of an audiophile show from the San Francisco Bay Area, Constantine and dagogo.com took a huge risk. 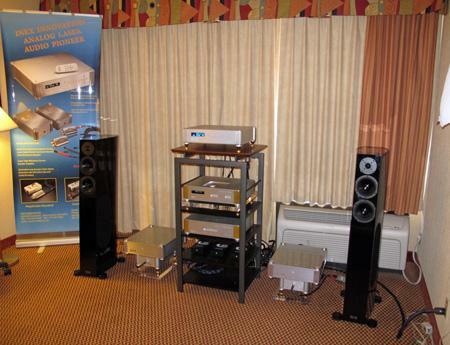 In his second, equally well-appointed room at the CA Audio Show, Elite Audio's Michael Woods was telling a visitor "People think that Meridian equipment is only for showing movies. But it's excellent for audio as well." 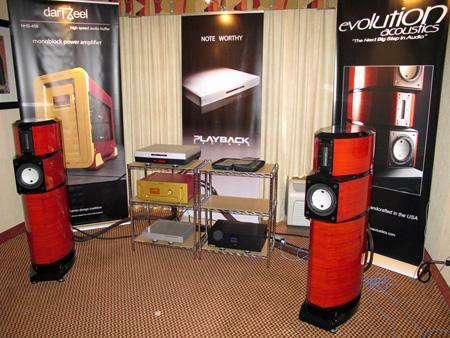 Given that the DarTZeel-Evolution Acoustics-Playback Designs room at T.H.E. Show 2010 blew both me and John Atkinson away, and earned my "Best of CES 2010," I was extremely eager to take another listen. Rarely do I have time to visit a room twice, let alone space to post multiple blogs on a single exhibit. 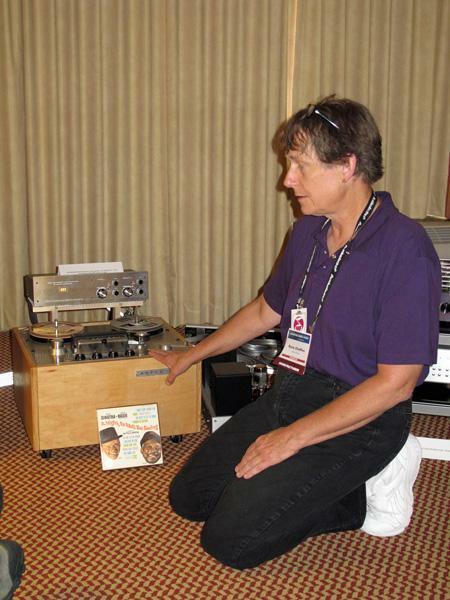 But because deHavilland/KE Engineering's Kara Chafee first showing of her KE Engineering/deHavilland Model 222 Magnetic Tape Playback Preamplifier ($1,995) was severely handicapped by the lack of her deHavilland KE 50A monoblock power amplifiers ($9995/pair), which had been delayed in shipment, I made sure to return when I learned that the amps had finally arrived. 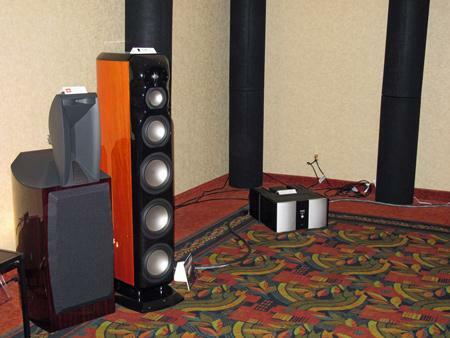 At the other end of the room from the JBL Everest DD-66000 I wrote about on the first day, Design Interaction was switching between the JBL 1400 Array ($11,000/pair) and Revel Ultima2 Salon loudspeakers ($22,000/pair), both speakers very well-reviewed in Stereophile. 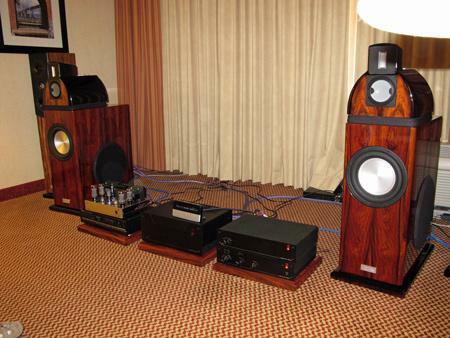 Heard through a dark-charactered Mark Levinson No.532 amp ($20,000), No.512 SACD player ($15,000), and No.526A preamp ($10,000), hooked up by MIT Oracle cables ($3500, with allocation not specified), the much fêted Revels smoked the less expensive JBLs, I thought. Judging from the sound, Inex Innovation is onto something really good. Begun in 2004 "by a gang of audio enthusiasts. . . with strong engineering backgrounds in the field of fiber optics and telecommunication," the company specializes in manufacturing cables and equipment that incorporate high-end telecommunication fiber-optic technologies. Towering Alan Dwight Hulsebus of Raven Design Studio was proud to show off the unusual skeleton of his Raven Ebb loudspeaker ($12,000/pair). Manufactured and designed in Camarillo, CA, the speaker includes a proprietary Raven ribbon and Focal drivers (including two rear-firing drivers to optimize room interactions), and is wired with Clarity cable. 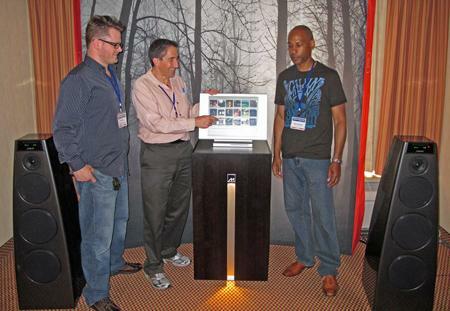 (Exhibitor Orca Design and Manufacturing distributes Focal in the US.) Claiming a frequency response of 40Hz50kHz ±3dB, with a nominal impedance of 6 ohms and minimal impedance of 5 ohms, the 86dB-sensitive loudspeaker was paired with Superlative Audio's SSA-250 50Wpc amplifiers ($30,000/pair), Oppo BDP-83 SE player ($899), Benchmark DAC1 HDR DAC/preamp ($1799), and a host of Clarity cable. How can you not love these adorable little components with the lovely little sound? With tube holders that glow in the dark, these cuties are manufactured and designed for Fremont, CA-based Napa Acoustic by Mistral in China. 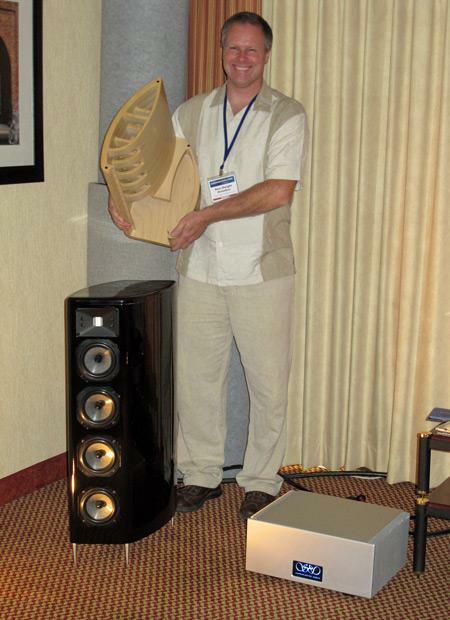 Bob Walters, coordinator of the Bay Area Audiophile Society, pegged Tonian Acoustics as one of the best-sounding loudspeaker exhibits at the Show. If only I could share his enthusiasm for the Tonian Acoustic Classic 7.1 ($5500/pair), a 16 ohm loudspeaker with 95dB sensitivity is inexplicably absent from the Tonian Acoustics website. 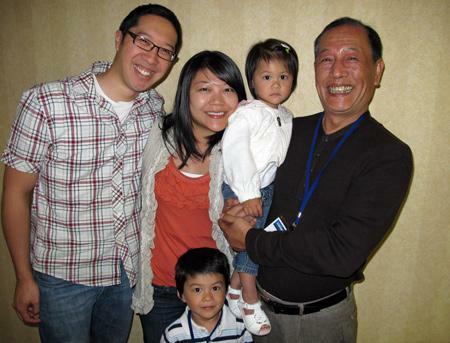 Just as I entered Emeryville's Hilton Garden Inn on the final day of the show, YG Acoustics' Yoav Geva (fourth from left) and his extended family were making their first visit to the Hilton. Filling most of an elevator, our little passel of smiling faces made its way to the YG Acoustics room. 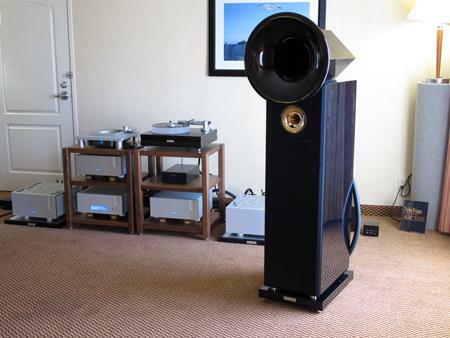 Once again, Acoustic Zen's Robert Lee had me lusting after his Crescendo loudspeakers ($16,000/pair). 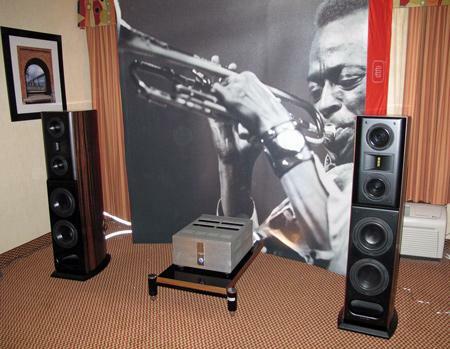 This time, they were ensconced in the elegantly appointed Elite Audio Systems room put together by proprietor Michael Woods of San Francisco. 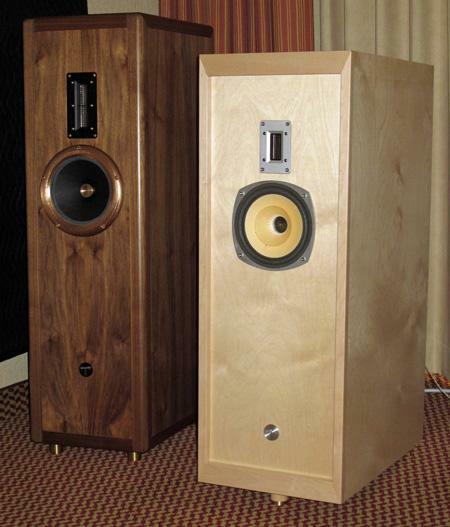 Fritz Heiler of southern California has been building custom loudspeaker systems for 37 years. Called into action at CAS 2010 were his Carbon 7s ($1750/pair shipped, or $1650/pair for show attendees who acted in time). Equipped with ScanSpeak drivers, these babies have a frequency response of 39Hz20kHz, ±3dB, and a sensitivity of 88dB. Their special crossover is free of caps and resistors, having only one small inductor on the mid/bass driver. 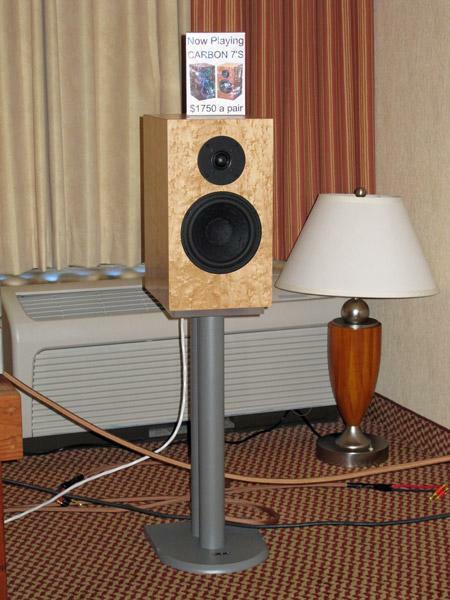 I had heard much positive buzz about the fascinating-looking Salk SoundScape loudspeakers. Equipped with the excellent RAAL custom ribbon tweeter, an Accuton midrange, and a separate Acoustic Elegance woofer, the Soundscape 10 ($9999/pair base price, or $13,999/pair with a 12" woofer) is said to perform from 21Hz60kHz, ±3dB. It also offers adjustable tweeter and midrange ambience, and looks like a baby that will attract lots of positive attention in your living room.